Hello, fellow netizens! It’s me again, and today I’m here to (hopefully) disseminate some needed information to the public, in the hopes that I can stop an exponentially proliferating scam that is bilking millions of gullible Americans out of their money – which is abhorrently evil at this time of Christmas! I was (un)lucky enough to be contacted by theses people, and I played along, to see exactly what would happen. My story in full appears below. I urge each and every one of you, my friends – if it sounds too good to be true you know it is. But unfortunately people who are in dire straights, emergency need, or are already mentally wrecked by worry over their financial situation are falling for this. I’m doing all I can to stop it – but that includes letting the public know what is happening around us. If you are the victim of what is being described in my story, please, don’t keep quiet and hope that it will go away – I urge you to get in touch with your local law enforcement officials and local divisions of the FBI to stop this. From here on out this blog post is what I am submitting to the Associated Press, in hopes that they can help us stop this heinous felony. When I woke up this morning, the last thing on my mind was that I would uncover a “Cyber Crime”. I, as a general rule, don’t usually deal with crime of any kind – I am the owner of a small business that fixes computers, equipment, and cellphones for the public or private individuals. My business is on the web – I have purchased a legitimate domain and have real contact information there. But these “Cyber Thieves” have created a scheme that has been so artfully inseminated into the public access of the World Wide Web that anyone, even people who think themselves “above the level” of this kind of scam artistry, have been known to fall for it because of the skill of the perpetrators at playing on the one weakness we, as the sum of mankind, will always fall prey to – no matter who you are; the fault of empathizing with the perpetrator themselves. Here is where I tell you my story of how I switched careers (for a day) from IT Professional to Investigative Journalist. Everything started when I performed a field service call for one of my clients. In my business, there are two types of proprietors. There are those who set up shop and have their clients bring their equipment to them for repair, or people like me, who perform Field Service work – we go to our Clients to do repairs, troubleshooting, or upgrades. We usually charge a fraction more than the repair shops (local repair shops or outfits like Best Buy) because we provide the luxury of not having to disassemble your workstation or equipment and haul it around – we repair on site. I have been doing this for a couple of years now, as an Independent Contractor for a couple of companies, but this year, I opened my own business and continue the same work, just for myself. I am very happy to report that I have a staff of 1 – I don’t have to worry about meetings or authority to make managerial decisions any more, as I am my own company. This morning, I had scheduled a call for a client locally, a wonderful lady with the sweetest personality you could ever ask for – I am leaving her name out of this story at her request, which I happily honor – and while I was onsite I was told about an event that had occurred only yesterday. I couldn’t believe the story, i thought no one could possibly be that cruel or have intentions that evil – so I decided to see if I could re-create the situation leading to the actual commission of the crime. It was unconscionably easy for me to follow the same steps that occurred to my client and get the same result that she did. However, the aftermath has left her devastated, depressed, and discontent – the 3 D’s that you do not want to have at Christmas time. I took an email ( the origination of this crime) from my client and forwarded it to myself, to get the contact information needed to re-create the incident. From that point on, the incidents I describe actually occurred to me. So I called the company in the email, who called themselves “Net Advance”. I got them to send me an email, which I am attaching to this missive, proving they are willing to do anything to rob a gullible victim blind. The phone number I called was 1-469-248-8203. It is a cellphone number that shows up on caller ID as Dallas, TX, USA. A very nice Asian Indian man answered the phone, and told me his name was “A J Wilson” and he said that I had been pre approved for an unsecured payday loan in the amount of $1000 . He told me that they were a chain payday loan store, and they had prequalified me on my credit for the loan amount of $1000. He said that the only thing they required for verification that I would be able to repay the loan amount, in the time period specified, was that I prove I could make the payment amount by loading it onto a “Green Dot” money card from my local CVS -they would stay on the phone long enough for me to get in my car, drive downtown, go into the store and purchase said card, and give them the number so they could verify that I could make the payment amount. They told me that they were not asking for the money up front, that the amount I loaded for verification would be reimbursed in the loan amount. So I needed to go get a Green Dot Moneypack in the amount of $160 (that would be my payment amount, for 12 months) and once they had successfully proven that I could pay back my payment amount, the total loan amount of $1160 would be drafted into the checking account of my choice. Now, as an educated man, and certainly one who works in the field of IT as a profession, I knew this was a scam. I still couldn’t believe that the man I was talking to was giving me this story so artfully devised to put anxious but needy people at ease, and he actually expected that both he and I could benefit from the transaction. Being single, and having a couple hundred dollars that I could afford to throw away (because I knew which direction this event was headed toward) without hurting myself financially, I decided to see just how far this would go. I was stupefied when it actually progressed through the commission of the crime! So i told A J, at Net Advance, that I would go get a Green Dot card and call him back. He actually wanted me to stay online with him throughout the whole process, but I promised I would call back. And I was going to – I had to see how far this would actually go. I told him that I appreciated the paperwork, and I gave him the Green Dot Number. I thought surely that this would be the end of the fiendish debacle, but I was wrong. I was so very wrong. He told me that he would call me back in 30 minutes to finalize the loan. I hung up and thought I’d never hear from him again. But in thirty minutes (this is the time it takes for a purchased Green Dot Moneypack to make the funds available to transfer online) he did call me back. This is where the real fun began. So, AJ called me and told me he appreciated that I went through with the “verification process”, and he was ready to help me. But, he said, being that this is an unsecured loan and my credit score was not high enough (we had never discussed credit scores throughout this conversation) a certified FTC Officer who worked onsite would require a second verification. He said I would need to go back to the CVS and purchase another money pack, for the amount of only $100, so that the government offices of the FTC could verify that I would repay the loan and would not default on them. At this point, I informed mr “A J” that I would not provide any further funds, and that I expected him to complete the process, to see what he would do. He began to harangue me over my refusal to “complete the transaction”. At this point I was thoroughly convinced that nothing else about this entire situation would surprise me. I was wrong yet again! He asked me to hold, and he handed the phone to another guy who was in the room with him, and this man told me he was with the FTC (in a more heavily laden accent than even AJ had used) and he needed me to complete the transaction, or I would be breaking a financially secured contract backed by the FTC. Now, as far as my studies in Government from High School and College go, I don’t think I ever heard tale of an FTC officer who had to have monetary verification before he would approve a transaction. So I let him ramble for a couple of minutes. Then I told him I was going to alert the authorities to his actions and informing everyone that I could about this situation, because I couldn’t believe the lengths that these people would go to in their felonious scheming. I hung up. and promptly started writing up a report of what happened. I decided to do a little more research, and I scoured the web for the company logo on the document he provided me. This is where I learned that “NetPay Advance” is a real loan company – but they are not a franchise – they are located in Kansas. They were unaware that their property was being perverted to the use of bilking innocent American citizens in need out of their hard earned funds, and especially so here at Christmas. I told them my story and urged them to contact their local law enforcement as they were unwitting victims of this heinous enterprise. During this time period, I got not one, but 3 more calls – all from different states (according to called ID provided by AT&T to it’s iPhone 6, which is what I use) with the same story, but a different company name. Now I had been contacted by “Net Advance” and another company called A1 Cash Advance – with the same story. In fact, to me it seemed as if it were the same people I had talked to previously. I did a quick Google search, and of course, A1Cash Advance is a legitimate company somewhere in the midwest, but it was registering from a phone number in Indianapolis. Same story, same crime perpetration (attempted). So I started asking for emails and contact names – and I was provided with them! I am including at the end of my story, so that if any of you get calls from these people or phone numbers, or email from these email addresses, you can contact your local law enforcement, local divisions of the FBI, or even Interpol if you are international, and we can find these people. I was dumbfounded at the list of names and numbers i was given. So after that – what started off as a bad situation had escalated to an all-out crisis situation that I could not ignore, nor would I let anyone (least of all anyone I know personally) fall for this. As I said, I have reported it to the local and federal authorities, going as far up the chain as I had access to – but I can’t rest knowing that some people, some really good people in desperate situations are losing everything they have in the hopes that it is real. Yes, I have contacted my authorities, but as an American Citizen myself, I can not let this go without trying to inform as many people as possible of what is going on. So I have turned my experience into this article, as any good investigator would do, and I am now trying to get the word out to as many people as possible, as quickly as possible. I hope that the Associated Press, whom I am forwarding this blog post to, will take action and help spread the word. I, as an American Citizen and a member of the human race, can do no less if I hope to be able to resolve my actions conscionably in the future. If you or anyone you know has suffered an encounter with the entities listed below, please do not wait – contact your local law enforcement and your local office of the FBI now. Only as Citizens standing together can we stop these perpetrators from preying on the less fortunate. Thank you for your time in reading this – I can easily be reached at any time in the normal way – you can find me online easily. I just hope that we can stop these fiends before they do any more damage than they have already done! If you receive any communication from any of the above listed phone numbers, names, or email addresses, please forward them to your local law enforcement officials. Hopefully we can stomp out this spark of devious ingenuity before anyone else can be hurt by it. ← My Annual Birthday Celeb Shoutout! They are still doing their scam. I got calls last week and even yesterday and even an email with the same information. They had my dob, phone number, email and address. UGHHHHH!!! They told me that they needed my bank account information so they could do a deposit of $5000 into my account and that I had to send the money back to them as soon as it hit my account and then they would approve my loan. 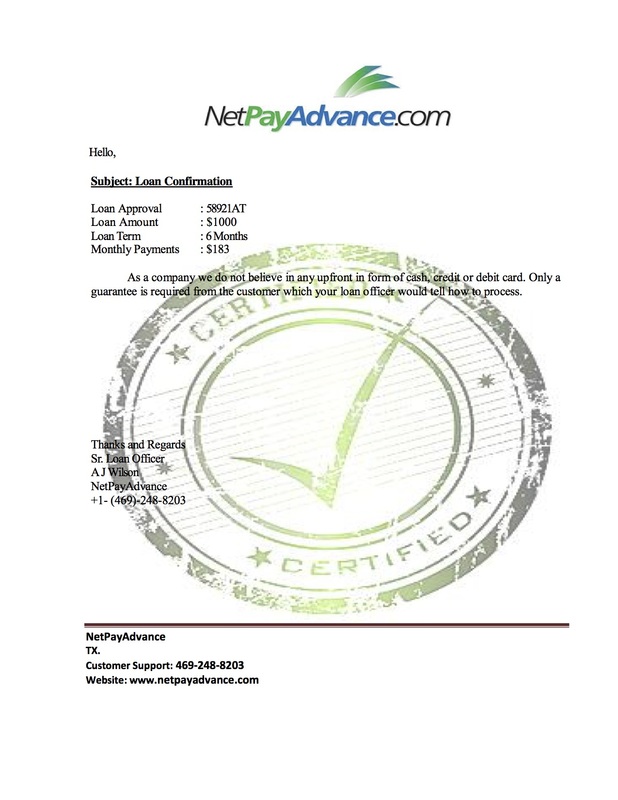 I almost fell for this until I decided to look the phone number up and noticed that it did not register as the main number for netpayadvance.com These people are scammers!! Same person contact me AJ Wilson and also Brian Johnson from 469-398-8007 and also 469-248-8203. HE EVEN CALLED ME BACK YESTERDAY ASKING ME IF i HAD DONE MY RESEARCH AND IF i STILL WANTED TO PROCEED WITH THE LOAN?!! !